It sits, like so many others, a reminder of the hopes and hard work of B.C. pioneers. They built well. The house roof sags a bit, the hen house and garage are gray and weathered, but they’re sturdy and they still stand. Homesteaders didn’t build for show, they built for practicality. The barn, quite naturally, is the largest, most handsome building. It’s in good repair, ready to shelter stock. The men who nailed those boards, and cut out the windows would be proud to know their work has survived decades of scorching summers and freezing winters. The buildings have lasted longer than the homestead itself. The rich interior grasslands of B.C. were ideal grazing lands where ranchers pastured large herds of horses and cattle. In the early 1900’s the Canadian government opened these leased lands for homesteads. To Europeans, restricted by the class system, where the only hope of obtaining land was to inherit it, the promise of one hundred and sixty ‘free’ acres, if the farmer put up buildings and planted crops, was a powerful magnet. Homesteaders, especially those who arrived during a year of plentiful rain, believed they’d have no trouble raising grain and cattle. Compared with those who stayed in Europe, they would be wealthy. Reality was a shock. They had no idea how much a dry-land farmer in a semi-arid location depended on rain. They soon discovered that having water rights on a stream or lake meant nothing when the water dried up. Over a few years crops varied from abundant to scarce. Weather made all the difference. 1912 was a good year, but, in 1922 the harvest yielded only one sack of grain per load. January 1930 was so cold people crossed the frozen Thompson River by car, but, by July 12th, the temperature was 112 degrees F. in the shade. No matter how diligently the farmer and his family worked, many could not make a living and moved on, leaving their homesteads. 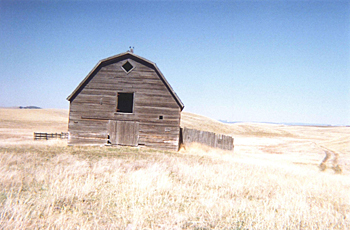 The land was purchased by determined ranchers, who took down many fences to open up the area. 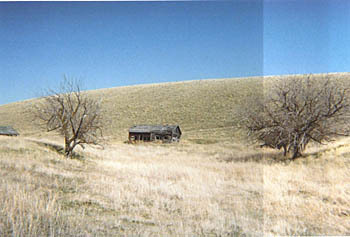 Gradually the homesteads returned to grazing lands, where empty buildings and wagon tracks across the hills are memorials of settlers now gone. This homesteader placed his barn atop a gentle rise. It’s the first building to catch the eye. The house, itself, is lower and more sheltered, near remnant trees which indicate that water, if any, would be found here. The henhouse and garage are an easy stroll from both house and barn. When the homesteaders left, they didn’t take everything. An old pickup truck still sits in the garage. Rolls of wire fill the henhouse where nest boxes line the walls. Mangers in the barn wait to be filled with hay. In the house, furniture; a bed, a cupboard, a table by the window, remind passers by that here the farmer’s family looked out at breakfast to assess a new day. There are no people here now, but there is still vigorous life. Spring and fall, migrating sand hill cranes alight to rest and feed on their journey. Their haunting cries are the sound of changing seasons. Meadowlarks trill from every other fence post. Blue birds, of a blue so brilliant it doesn’t seem quite real, flit about. Swallows nest in the barn. Ravens and hawks soar through the skies. The most un-expected avian inhabitants, a pair of great horned owls, make their home in a near by tree where they sit so still that the most proficient birder requires imagination as well as keen sight to spot them. Nonchalant marmots enjoy themselves spread-eagled on the ridge top of the old house, sun-tanning in defiance of the hawks. The cattle are back, too. 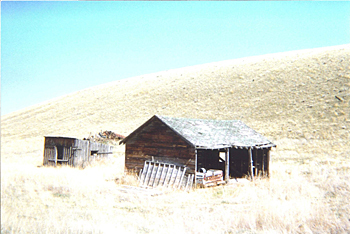 The old homestead has returned to its former self, part of the grazing lands of a long established ranching family. Livestock co-exist with wildlife. The homesteaders are a poignant memory.